Three Tethering - How much data can you tether? Does Three allow tethering (personal hotspot)? Tethering is allowed on Three's network on all plans and there are no limits to the amount of data that can be tethered in the UK, so you use any or all of your data to tether over a personal hotspot. That means those on unlimited data plans can now enjoy unlimited tethering! So there are plans with unlimited tethering? 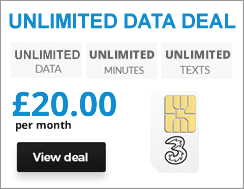 That's right there are a range of Three plans with unlimited data which include free unlimited tethering. That makes them a great alternative to home broadband and you don't need a landline. We've put a couple of the most popular deals in the table below for you to checkout. Can I tether when abroad? Tethering is supported on all plans in Go Roam in Europe destinations. However, data usage in the EU is limited to 19GB per month on all Pay Monthly plans and 12GB per month on Pay As You Go plans. Tethering is not supported in Go Roam around the World destinations on any plans. However, you can purchase a Data Passport which offers unlimited data and tethering for £5 a day. Will Go Binge usage come out of my tethering allowance? No, any tethering of Go Binge services on compatible plans won't come out of your tethering allowances. How can I check my tethering allowance? Tethering can use up a lot of data so you’ll probably want to monitor your usage. On Three that’s easy to do though. As it just comes out of your normal allowance, in most cases you can check how much data you’ve used and got left by heading to your My3 account here or by downloading the Three app. What if I want to continue tethering beyond my allowance? If you’ve used up all your data and want to keep on tethering then you’ll usually be able to buy an add-on. There are a range of add-ons available for all types of plans including Pay Monthly, SIM Only, Mobile Broadband and tablets. View add-ons by logging into your My3 account here. Three plans taken out before July 12th 2016 include different tethering policies depending on the contract type and when the contract was first taken out. We've summarised the tethering limits for older plans in the tables below. * If you have a Three Pay Monthly tariff which started on or before March 17th 2014 then tethering won’t be included and you’ll have to pay £5 for a 1GB monthly personal hotspot add-on. * If your SIM-Only plan started before the 15th of July 2014 then tethering won’t be included and you’ll have to pay £5 to get a 1GB monthly allowance.